It wasn’t that bad, but I’m happy the technology has improved considerably since then. Those methods are still available. They work very well, there’s no reason to shy away from them, and a lot of people still use them. Many say you can’t get a better high gloss surface for modeling still-water than with these epoxy kits. However, at least now you have lots of other options for model railroad water that are relatively simple to master, and you can have all the fake water you want on your model train layout, with no more difficulty than putting down ground turf or any of the other multiple things you do to develop your model train scenery. Some of these acrylic products can be tinted with a drop or two of acrylic paint, but not too much, to make the water look blue or muddy. First, cut out a shallow hole in your layout surface deep enough for a 1/8-inch layer of “water” and however deep you want your banks to be. Taper the edges of the “banks” to be steep or shallow, as you wish. This step should be easy if you’re using extruded foam as the top layer(s) of your subroadbed. Prepare the surface of the pond by laying soaked plastercloth on the surface of your depression and mold it into the area to serve as the base for your pond. Apply a little extra amount of Hydrocal and spread in on the surface to be sure there will be no leaks ant the fiber of the plastercloth is covered. The bed of the pond should be very flat and level as much as possible, even if the rest of the surrounding terrain is not level. Let this dry overnight. Sand the base of the pond smooth the next day. If you see any openings in the bottom, use Hydrocal or spackling compound to fill them in. Next, put down all your usual ground cover around the edges of the pond and on the top of the banks including the appropriate paint or stain base, grasses, bushes, sand, rocks, etc. Use earth color to paint the banks down to the water level.Paint the base of the pond flat black as a primer. Once this is dry, start at the center or “deepest “ area of the water with flat black mixed with a very small amount of cerulean blue, blue-gray or green-brown (whatever your preference is for the color of the water, but definitely not sky blue or bright green). As you work your way out to the edges of the pond in a circular or oval fashion, add more and more of the color to the black so that the shallower water will have more color than the deeper water, blending each different shade of the colors into the one before it. When you get to the banks, use a stippling effect with your brush to blend the “water” color into the earth brown paint on the banks. Now you can place small rocks around the bottom of the banks along with weeds, cattails, etc. If you wish to place a small boat or canoe in the “water”, attach it now with a small drop of glue, and let it dry. Now apply the Realistic Water (or whatever other water medium product that you have decided to use for your model railroad water), following the directions that came with the product carefully. Apply one coat or one thin layer at a time, and let it dry for 24 hours. Then add more thin coats if you need to build it up further. It’s easier to add several thin coats than to put too much down at once. Some of the product may wrinkle or crack if you try to put down too thick of a coat the first time. Once your final coat is dry, then you can fix up the edges of the banks with more sand, ground turf or vegetation as you wish. Add people and pets swimming, fishing or boating. Another, even easier method is to use high gloss acrylic medium for your model railroad water. Prepare the bed as above, but when it comes time to add the water medium, brush on a coat of high-gloss acrylic medium instead. This goes on white but dries clear. Add more coats as you need to. You can make small waves or ripples with this by how thick the coat is and how you apply the brush strokes. I have read about other methods for simulating model railroad water such as using a sheet of Plexiglas, painting the bottom as you would the base of the pond, laying the Plexiglas down into the bed with the painted side down and then applying high gloss acrylic medium liquid to the surface. This is supposed to give the water more depth. I’ll be anxious to try it the next time I need a lake. 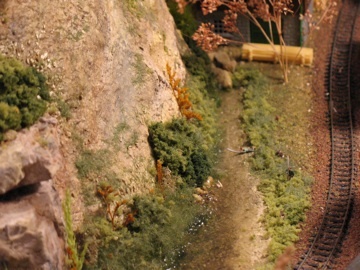 One of the most interesting scenes you can create on a model railroad, I think, is that of a stream weaving along the side of a railroad track in a hilly or mountainous region. The first thing to think about is, does the stream have a source and a destination, real or imagined? It can’t just end in a clump of trees. It could go behind a hill into an area imagined, but not visible. It could empty into a larger body of water. You could have 2 or 3 creeks winding down from the mountains and joining into a stream or river. The preparation of the bed is similar to that described in the pond section, except that the surface doesn’t have to be perfectly smooth and flat. In fact, you may want a lot of irregularity in the surface. (Sculptamold could be used for the base.) Also, the paint colors you use for the riverbed may be more likely a green-brown or gray-brown color since moving water is usually muddy; although it doesn’t have to be. You may want rocks or trees in the water at the edge of the river. You may want to add fallen trees or branches at the water’s edge. After you have most of this scenery in place, use the high-gloss acrylic medium and brush the fluid onto the surface of your riverbed. You can simulate rippling and rushing model railroad water by using a stippling and/or streaking effect with your brush or small stick. The water downstream from rocks or branches will have more evidence of agitation, which tapers to a point a cm, or two behind the rock or branch. You may want to use high gloss acrylic gel instead of the liquid acrylic medium to model very agitated water in rapids or over short waterfalls. Use reference photos to help make your streams, rivers and lakes as realistic as possible. It always helps to see what it looks like in a photo rather than trying to reproduce it from memory. You will almost certainly detect and reproduce more details that way. 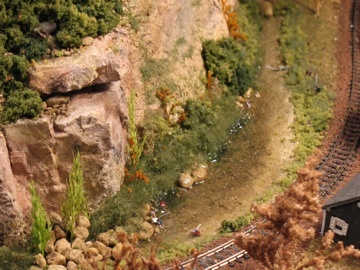 The better your model railroad water looks, the happier you will be with it in the long run, and the more enjoyment you and others will get out of it. www.unrealdetails.com - Home of "Magic Water" water modeling resin. 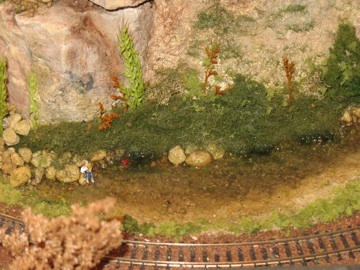 From "Model Railroad Water" to "Model Train Scenery"
From " Model Railroad Water" to "Homepage"